Above photo, date unknown by Darkstar. Reference to this pub has been found from the Police Reports of February 1949 as published in the Sevenoaks Chronicle and Kentish Advertiser. However, there is also a "Bat and Ball Tavern" listed at nearby Leigh, and this may be the same pub. 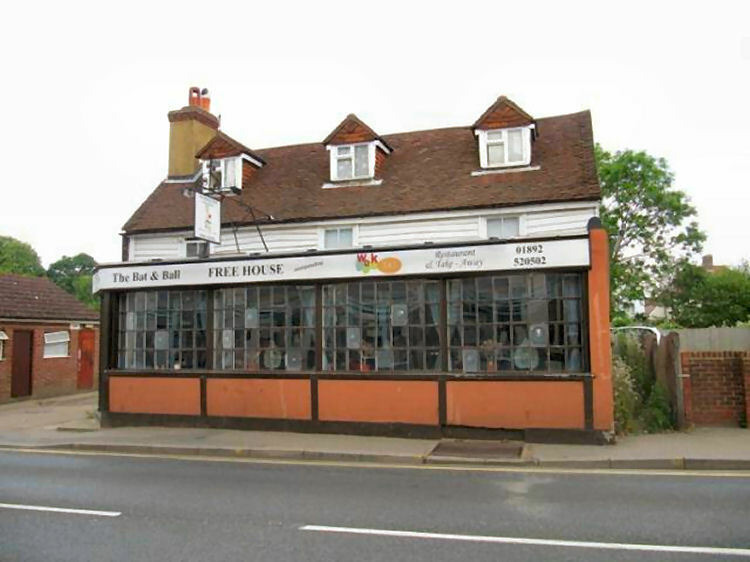 According to http://www.closedpubs.co.uk (2017) the pub is closed, but date of closure is not given. Kent & Sussex Courier, Friday 30 August 1878. The following report was laid before the Justice's on Tuesday by Superintendent Kewell:- Kent County Constabulary, Tunbridge division, 27th August, 1878. William Dolding, keeper of the "Bat and Ball" Beer House, Southborough, was summoned for permitting drunkenness on his licensed premises, but the case was dismissed. Sevenoaks Chronicle and Kentish Advertiser 11 February 1949. No opposition was offered to applications for full licences made by Harold Henry Wicks, "Bat and Ball," Southborough.